"Taichi" represents the philosophical state of undifferentiated absolute and infinite potential. It's ASRock's biggest offering in the easy-to-use, rock-solidly stable line of motherboards that fulfills every task – with style! Specially designed for the all-round PC user who wants a motherboard packed with premium features. 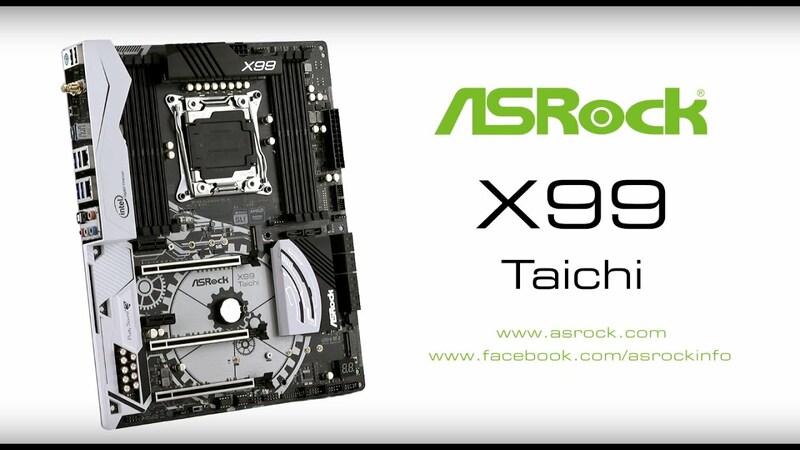 Specially designed for ASRock X99 Taichi motherboard, Bitspower water block is a high performance water cooling solution that also includes RGB LED lighting, thus players can select the color and lighting effect they like. The kit is able to cool Intel® LGA 2011-v3 socket CPU and power regulation (VRM / MOSFETs) module. Unlike the high-end CPU tower cooler’s fans always run at a very high RPM with annoying noise. Users are allowed to choose a quieter fan for their water cooling solution. *Water block not included in motherboard package. For purchase information, please contact Bitspower. Designed with 12 Power Phase design, this motherboard features sturdy components and completely smooth power delivery to the CPU. Plus, it offers unmatched overclocking capabilities and enhanced performance with the lowest temperature for advanced gamers as well. The 8 Layer PCB comes with 4 sets of 2 ounce copper inner layers, providing stable signal traces and power shapes and delivering lower temperature and higher energy efficiency for overclocking! Thus, it's able to support the latest DDR4 memory modules with most extreme memory performance! Combining two silicon dies into one MOSFET, Ultra Dual-N MOSFET provides larger die area and lower Rds(on), so the power supply for the CPU Vcore is more efficient. This motherboard is capable of supporting DDR4 ECC and RDIMM (Registered DIMM) memory modules which deliver server-grade performance and durability for high-powered computing systems. * ECC is supported with Intel® Xeon® processors. *Intel® Core™ i7-59xx/58xx processors only support Intel® Turbo Boost Max Technology 2.0. *If you install CPU with 28 lanes, PCIE2/PCIE4/PCIE5 will run at x16/x0/x8 or x8/x8/x8. Supports NVMe SSD as boot disks. *SSATA3_3 connector is shared with the M2_1; SSATA3_2 connector is shared with the M2_2. RAID is supported on SATA3_0 ~ SATA3_5 ports only. ***If you install CPU with 28 lanes, the M2_1 only supports SATA type M.2 module. **The CPU Optional/Water Pump Fan supports the water cooler fan of maximum 1.5A (18W) fan power. ***CHA_FAN1 and CHA_FAN2 can auto detect if 3-pin or 4-pin fan is in use.